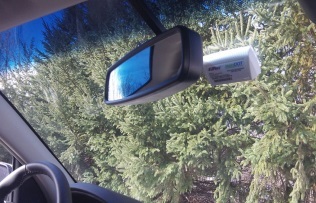 Your interior transponder must be mounted to your windshield, just to the right of the arm holding your rear view mirror and below any tinting. Make sure the arrows on the transponder are pointing upward. Peel back the plastic film on the fastener strips and attach the transponder to your clean, dry windshield. Motorcycles –The transponder should be mounted on the motorcycle. If there is no windshield, it can be placed in a shirt or jacket pocket. Improper mounting may result in additional fees and a higher toll rate. Do not place it on your dashboard. Do not hold it in your hand. Can I use my transponder in another vehicle? Your transponder may be used in another vehicle as long as all license plates are listed on your account and all vehicles are the same class. You may use the transponder from your passenger vehicle to tow a trailer if you list the trailer plate number on your account. The E-ZPass system will automatically count the number of axles and charge your account accordingly. Prior to travel, request a second transponder programmed for the total number of axles including the trailer. Remember to keep the transponder you’re not using in a foil pouch to prevent both transponders from reading. What should I do with my transponder? You are required to remove the transponder from your vehicle. Place it in the foil bag it came in or wrap it in household aluminum foil to prevent it from reading until you are ready to use it again. Mail it to the address on the transponder. To prevent it from reading during transport, place your transponder in the original foil bag or wrap it in household aluminum foil. Return it to one of our Customer Service Centers. If you think that your transponder is not working. Please visit or mail it to a Customer Service Center to have it tested. How do I know if my transponder is not working? If your license plate is listed on your account, the Transaction will be listed as a V-Toll* on your statement. If your license plate is not listed on your account you will receive a Pay By Plate invoice. *You will be notified by mail if you have excessive V-Tolls on your account. How can I add a transponder to my account?